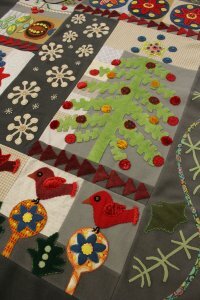 Get in the holiday spirit with this fun wool applique quilt, Crimson Tweed, designed by Sue Spargo. This nine month block of the month program includes the wool, cottons and velvets for the quilt top. Just $29.99 a month. Get yours today! Our first Stitching Hope Pillowcase Workshop was a lot of fun and we were able to package 47 kits. If you have time to help sew the pillowcases, we have them behind the counter ready to be checked out to you. Making these pillowcases are simple and fast. Thank you! Quiltapalooza is on Sunday, June 22, from 2-5 p.m. and you are not going to want to miss out on all the fun and new products. Register today to ensure yourself a spot as we are limiting the number of spots to 50 at Quiltapalooza this year to ensure everyone is able to experience and enjoy the new products. Guests will pay $10 in advance to secure their reservation and receive a $10 discount on Quiltapalooza purchases made that day. Once we meet the 50 person limit, we will open an additional session for sign ups. Register today. A reminder for you Tips & Techniques Club members! Your Thursday Tips and Techniques Club meets Thursday, June 5, from 6 p.m. - 8 p.m. and for Monday club members, Monday, June 9, from 12 p.m. - 2 p.m. You are not going to want to miss any techniques MJ will share with you. If you'd like to join in on the fun, sign up for next quarter beginning Thursday, Sept. 4, and Monday, Sept. 8. Do you love the simple and practical stitches of utility quilting? Join Jill Friday, June 13, from 10 a.m. - 1 p.m. to learn the basics of utility quilting. She will also share with you information about the variety of threads that can be used. 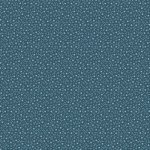 This is a versatile style of quilting that can be used on traditional reproduction quilt projects as well as modern quilt projects. Enroll today. Janet will have you stitching your nine patches and helping you layout your blocks for your Blooming Nine Patch before you can say, "Blooming Nine Patch." 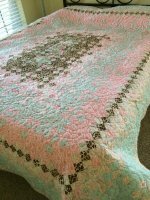 Join Janet Saturday, June 14, from 10 a.m. - 3:30 p.m. when she will share the secrets to making this simple but beautiful quilt. Some of her secrets include how to select fabric where the color "blooms" and how to layout your blocks for the project. You're going to love this quilt and the class. Enroll today. Get your kiddos ready. Summer camp is back and it's going to better than ever. Happiness Is ... Quilting! is partnering with Chestnut Square's Quaint Crafts Afternoon Camp. There are four sessions, but quilting is featured June 10-12 from 1-4 p.m. for children ages 9-13. Camp space is limited to 15 children. All materials will be provided for projects. More information and registration can be found at Historic Chestnut Square Village.